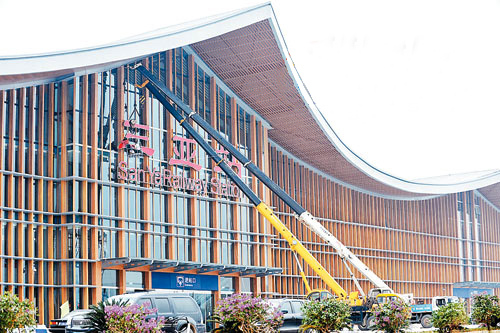 The construction and decoration work of Sanya new railway station has been basically completed, and this dynamic and modern train station will be opened to the public upon the trial operation of the East Ring Railway in Hainan, or Donghuan Railway, which is to link Haikou and Sanya by bullet trains. There are a total of 18 ticket windows in the ticket hall, and the station provides the passengers with convenient facilities. A huge LED screen shows the train numbers and timetable for passengers to check. The waiting room on the 1st floor is spacious with neat rows of seats. The walls are hung with LCD TV screens showing train numbers and departure times. Two detectors are placed on both sides of the gate of the waiting room for passengers to go through security checks. Both sides of the waiting room have a wash room, water and smoking room respectively. In addition to the escalator leading to the waiting room on the 2nd floor, a disabled-friendly elevator is available for people with disability and the elderly. These facilities in the train station offer great convenience for public transportation. The East Ring Railway will be put into opeartion this month. There are fifteen stations on the line and five more will be added in time. The trip between Haikou and Sanya will take only 90 minutes, half the time required to do the trip by road. The maximum speed of the trains will be 250 km/h.